Bergen Tools 4pc Hook and Pick Set. These hooks and picks are professionally manufactured from Chrome Vanadium Steel with a rubberised handle. The handle has been ergonomically designed with a screwdriver style handle, that provides comfort and grip and that extra control that you associate with a screwdriver style tool. 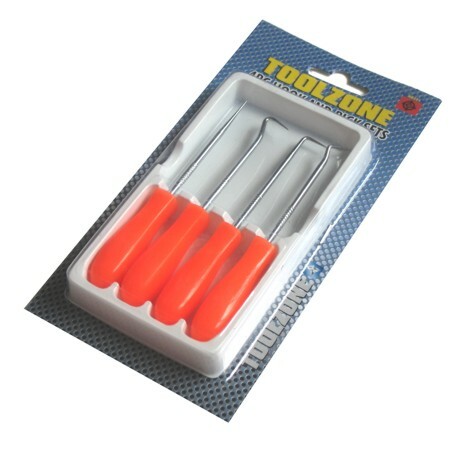 These hook and picks are perfect for the removal of small items such as cotter pins, O-rings and seals. Many home and automotive uses. Each hook and pick has a knurled band approximately 8mm from the handle, this can provide extra grip or 2 hand steady during complex or intricate work. Overall length including the handle is approximately 135mm. The exposed shaft length is approximately 75mm.